Next Year in Jerusalem recognizes that Jews have often experienced or imaged periods of exile and return in their long tradition. The fourteen papers in this collection examine this phenomenon from different approaches, genres, and media. They cover the period from biblical times through today. 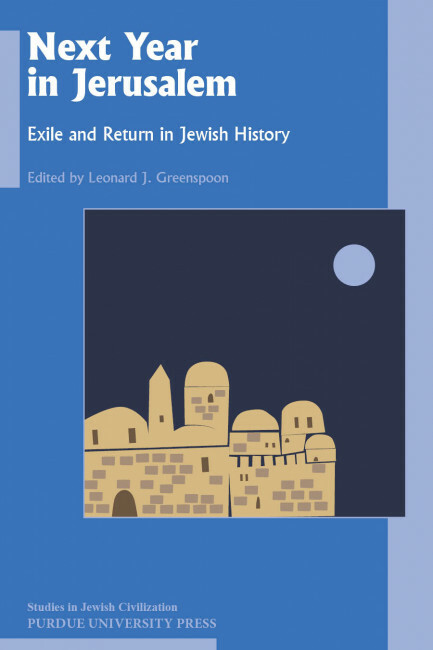 Among the exiles highlighted are the Babylonian Exile (sixth century BCE), the exile after the destruction of the Jerusalem Temple (70 CE), and the years after the Crusaders (tenth century CE). Events of return include the aftermath of the Babylonian Exile (fifth century BCE), the centuries after the Temple’s destruction (first and second CE), and the years of the establishment of the modern State of Israel (1948 CE). In each instance authors pay close attention to the historical settings, the literature created by Jews and others, and the theological explanations offered (typically, this was seen as divine punishment or reward for Israel’s behavior). The entire volume is written authoritatively and accessibly.